Sarah deKowzan, shown with the inspiration for her volunteer work at St. Raphael School. St. Raphael School proudly thanks Sarah deKowzan as the SRS Volunteer of the Year. Sarah arrived at St. Raphael School with open arms and is an important part of all our community and fundraising efforts. She co-chairs our annual Grandparents Day, leads Junior Achievement, and helps with our Golf Classic, SpringFest, Catholic Schools Week, Angels on the Run, and hot lunch program. Sarah chairs the St. Raphael School Board. A product of local Catholic education (St. Andrew Apostle, Holy Redeemer, and The Academy of the Holy Cross), Sarah is a woman for others. 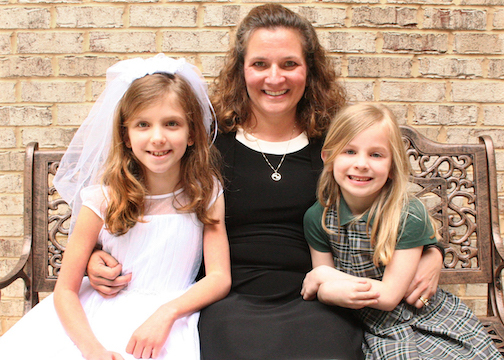 The mother of two SRS students, Sarah makes a difference every day. She will be honored at the Catholic Business Network of Montgomery County's annual gala on Nov. 30.